As I prepare for summer, I've been checking out new products to help me stay cool. One of the furrific new cooling products I've discovered is from The Green Pet Shop. It's called the Cool Pet Pad. The company also makes the Cool Flash Pad for humans, so now Mom can cool off too. The Cool Pet Pad is available in 4 sizes: small, medium, large, and extra large. I have the size medium. The size chart says the medium is for dogs 25 to 50 pounds. A dog in this size range would be about the size of a Beagle. I am not much smaller than a Beagle, even though I weigh much less (15 pounds). The medium Cool Pet Pad measures 15.5 inches wide by 19.5 inches long. If your dog is large for their weight (like me), I recommend getting a pad one or two sizes larger than the size listed for your dog's weight. It is always better to have a pad or bed that is too large instead of one that is too small. BOL! 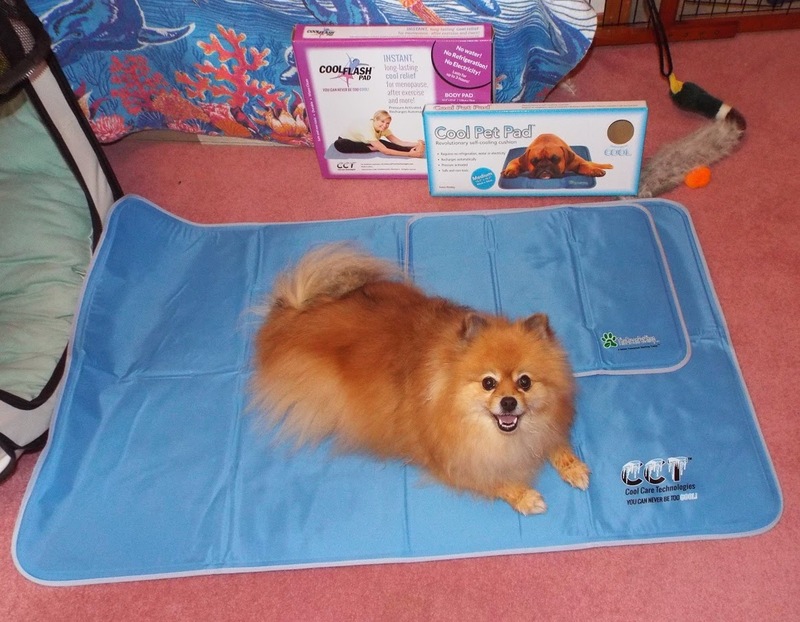 The Cool Pet Pad helps you stay cool by absorbing your body heat. It doesn't need water, electricity, or refrigeration. 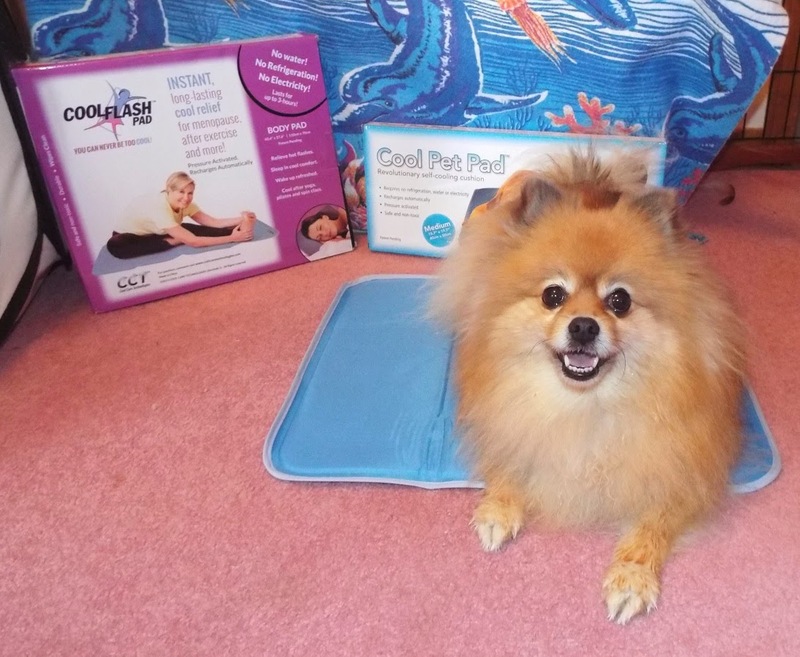 The Cool Pet Pad uses patent pending, non-toxic, pressure activated gel to absorb your body heat. The cooling effect can last up to 3 hours in some conditions (humidity, temperature, etc.). It refreshes itself after a short period of non-use (15-20 minutes). The Cool Pet Pad folds up easily for travel, so I can cool off anywhere. I will bark at Mom to put it in my car seat & in my stroller during our next road trip. You can put it in the refrigerator to make it extra cold, or to refresh it faster. The cooling effect could last up to 6 hours when the pad has been refrigerated or frozen. The Green Pet Shop manufactures the Cool Pet Pad in a medical factory. You know how Mom is always wanting to use my things? Well, I barked for the Green Pet Shop to please send her the human version of the Cool Pet Pad, and they did. Now I won't have to share mine with her. BOL! The human one is the same size as the extra large dog one. The human one is called the Cool Flash Pad. I think it is pawsome that Mom and I both have a Cool Pad. Thank you to the Green Pet Shop for helping Mom and I cool off. looks like a pawsome product. Great review. These would be great in the hot summer, but right now with our fresh snow, it isn't quite as appealing. I have a cool collar, but this might be good too for napping on. BOL!! If we had snow, I wouldn't worry about keeping cool either. It is a furrific item for summer when all of your snow is melted. BOL! My dogs are really hot natured, particularly my girl. I bet she would love this.